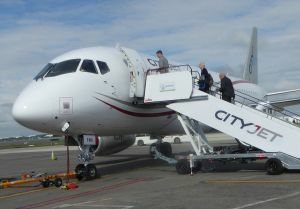 The first of the new generation of ‘passenger friendly’ regional jets has arrived in Europe with CityJet of Dublin as the lead customer. The Sukhoi SSJ100 Superjet is a breakthrough, not just for travellers but for operators too. As flown by CityJet, and with a 32in seat pitch throughout, it offers a 3+2 layout and a cabin height of 6ft 11in. This gives the air of being spacious and is clearly one step up in class from the average low-cost airline operation. 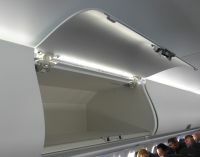 The overhead bins are full-sized, meaning that the now-standard large roller bag can fit comfortably, offering much more capacity. The seats, covered with Muirhead leather, are by Geven, the Italian specialist based in Naples with a host of well-known airline customers. The centre armrests come up, making the aircraft particularly suitable for passengers with a large girth. Expect to see rugby charters in the future. 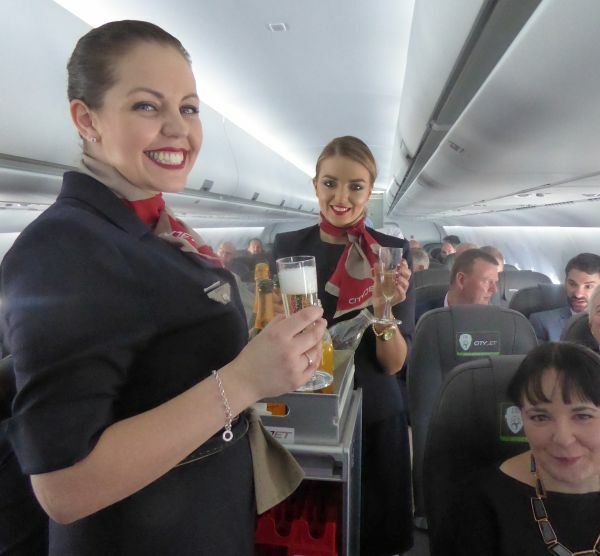 The Irish airline’s new fleet is all configured with 98 seats, compared with 95 for the Avro RJ85 it replaces which are admittedly from an earlier generation. The first BAe 146 entered airline service with Dan Air in July 1984, and the more fuel efficient RJ development 10 years later. The 146 cruises at 370 knots vs Sukhoi’s 425 knots, climbs somewhat slower, and burns fuel at 2.2 tonnes per hour vs 1.6 tonnes per hour of the new SuperJet. This means that the airline can get a further return sector in per day, most appealing for the bean counters. The aircraft is fly-by-wire with a sidestick control, rather like the Airbus series. The Sukhoi SSJ100 made its maiden flight in May 2008, the first airliner produced by a design bureau noted for its high-performance military jets. It is a first in other ways too; the first collaborative Russian civil aircraft, with Boeing as the design consultant, Alenia Aermacchi running the completion centre, and French engine manufacturer SNECMA a risk-sharing partner. To date, just over 100 have been built and are in airline service, with the order book, including options, standing at around 500. Mexican airline Interjet currently has 21 aircraft delivered (out of 30), with a claimed 99.9% dispatch reliability. CityJet became very recently the lead European operator of the aircraft, quickly putting it into service ferrying the Irish team around for the Euro 2016 soccer tournament. Charter flights are being made too, football fan trips predominantly, and, with the arrival of a second aircraft, a summer scheduled operation will shortly be launched from Cork to both La Rochelle and Nantes. CityJet was founded by Irish businessman Pat Byrne in 1994 and began operations between London City Airport (LCY) and Dublin under a franchise agreement with Virgin Atlantic Airways. It was later acquired by Air France, with the relationship remaining to this day on the London City – Paris Orly route. In March 2016, CityJet was repurchased by Byrne with private equity backers and a new management team installed, the object being to revitalise the loss-making airline, the second largest operator at London City Airport. The purchase order of 15 of the Sukhoi jets (plus 10 options) was the first initiative, followed quickly by a contract with SAS to acquire and operate eight brand new CRJ900 90-seat jets out of Helsinki and Stockholm on a three-year deal with a further three-year add on. CityJet currently operates 12 routes from London City and is also the official airline partner for London's ExCeL exhibition centre close by the airport. 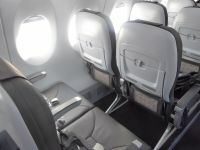 It offers a Premium Economy product on most routes. Introducing the SSJ100 at LCY is not currently a priority, mainly a software process with a development programme instigated. The plan is to phase out the RJ during 2018, swapping it for the SuperJet. All the fleet will be LCY approved, unlike the Embraer E-series (or A318), which have to be modified individually. 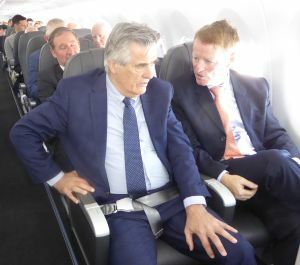 The future seems bright for CityJet, with Byrne telling The Irish Independent that the airline saw an initial public offering within two to three years. It expects to make a modest profit this year and revenue will increase to €300m within two years from the €177m earned in 2014 when it posted an operating loss of €22.7m. It also sees business in what is called ‘wet leasing’, where it hires out aircraft to other airlines. At next month’s Farnborough Air Show, the Sukhoi aircraft on display will be a brand new machine prior to delivery to CityJet. Prospective customers will be able to view the plane at their leisure. Now I know why I thought I recognised you on board. I should have said "Hello".